Fluence has more than 30 years of experience implementing food-processing solutions using ion exchange and adsorbent resins. Our innovative solutions are ideal for wine and fruit juice processing, as well as whey demineralization and cane sugar decolorizing. Fluence also is a global leader in the design of four simulated moving bed (4SMB) chromatography plants for the purification of fruit juices and the production of organic fructose without the use of chemical reagents. Fluence has decades of experience delivering cost-effective and efficient solutions for food and beverage operations across the globe. Our expertise spans the following processes, and more. Fluence’s demineralization processes offer very low reagent consumption and superior performance in concentrating treated juices for a high-quality end product. Fluence has solutions to recover organic acids and natural colors in fruit juices, such as malic acid, tartaric acid, and enocyanin. We nearly eliminate demineralization costs, increase overall plant efficiency, reduce energy consumption, and lower both the organic load in the wastewater and the quantity of sludge produced. Fluence solutions can be customized to reduce the plant footprint. Our technologies are carefully crafted to ensure optimum organoleptic properties of the end product through the careful selection of suitable materials and resins. Fluence provides solutions for the reduction of polyphenol concentration and for the complete decolorization of grape must, sugar cane, and other fruit juices. Our solutions result in the perfect control of the juice’s color and the recovery of natural colorants (enocyanin) without the use of alcohol. Our plants minimize organic load that is not readily biodegradable in wastewater treatment plants. Fluence’s solutions for debittering use adsorbent resins to remove the bitter taste of some types of citrus fruits. There are many applications of ion exchange and adsorbent resins, and the technology is continuously developing. Fluence works in close partnership with the most trusted resin production and distribution companies – including Resindion-Mitsubishi, Bayer, and Purolite – to address customers’ problems and deliver innovative, cost-effective solutions. 4SMB chromatography, a technique originally used to purify molasses in sugar refineries, uses only water to separate sugars from salts. Fluence’s unique expertise extends to 4SMB chromatography applications for fruit concentrates and whey. Our technologies do not use chemical reagents such as acids and soda because the resin doesn’t need to be regenerated. 4SMB reduces saline and contaminating load in wastewater. 4SMB chromatography also can be used to separate sugars such as glucose, sucrose, and fructose from demineralized concentrated must (DCM) and from concentrated apple juice. Our technologies are the only “green and purely organic technologies” certified by the international authorities in fruit juices and sugars processing. In addition to proteins, whey contains lactose and mineral salts, which can be recovered and converted into more valuable substances, such as baby food ingredients. The demineralization process, which uses ionic exchange resins, reduces the mineral load by 90%, preserving lactose and proteins. Crystallized and dried demineralized whey is used widely as a raw material for food products and in the pharmaceutical industry. If you’re looking for advanced, sustainable processes for your food or beverage plant, Fluence offers a range of cost-effective solutions including debittering, demineralization, decolorization, and more. Contact our experts to discuss your specific project details, and learn how our solutions can help you meet your goals. FOOD & BEVERAGE PROCESSING CHALLENGES? Contact us to learn more about our food and beverage processing solutions, or to discuss your next project with our experts. 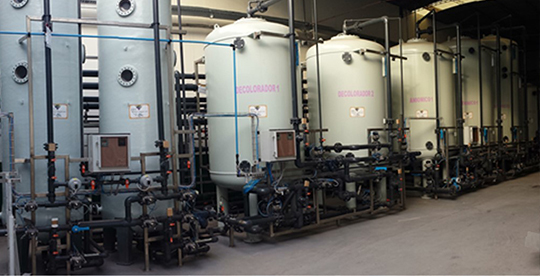 A premium grape juice concentrate producer needed a solution to decolorize and demineralize grape must at its facility in Mendoza, Argentina. Using ion exchange resin technology, Fluence successfully decolorized the must from both red and white grapes, achieving a density of between 20 and 22 Brix, with a maximum density of 24 Brix. The customer was ultimately able to create high-quality juice concentrates. Because of its commitment to sustainable development, an Italian production and trade company that offers products exclusively from organic farming chose Fluence to implement 4SMB chromatographic separation of its concentrated apple juice. The system produces less salty wastewater than plants using traditional ion exchange resins, and saves almost 60% in operating expenses. 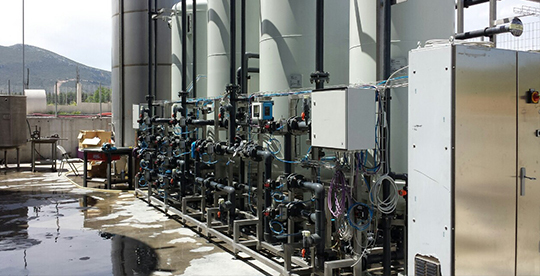 A historical winery based in Greece decided to build its own must demineralization facility when the cost of outsourcing the process became too high. Fluence developed a process scheme based on four columns in series through strong cationic resin (regenerated with hydrochloric or sulphuric acid), and weak anion and strong anionic exchange resin. The construction of an in-house demineralization plant resulted in significant savings and allowed for steady supervision of the process. 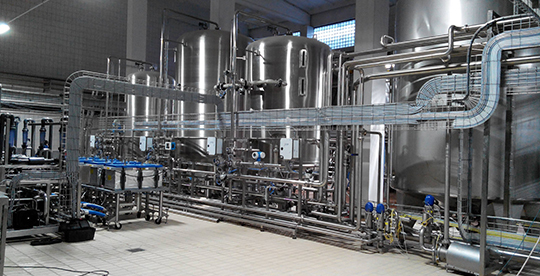 A company in Belarus with more than 60 years of experience in dairy product manufacturing hired Fluence to provide a whey demineralization plant so it could diversify its production and become more competitive in both the national and international markets. 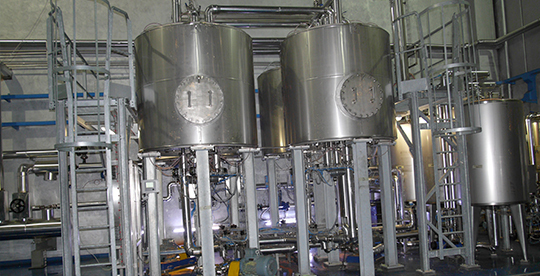 Fluence, in collaboration with GE, developed and installed a customized IEX demineralization system after electrodialysis (ED) to manufacture 90 demi whey cost-effectively and efficiently.